Their return flight was postponed indefinitely, after a Russian rocket failed in October 2018. 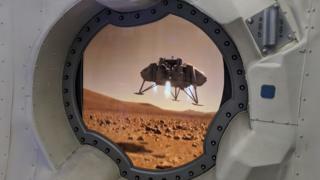 The company is working with Nasa and Elon Musk’s Space X to be “computer-ready” for the first Mars flight, estimated to take place in about 2030. Currently the 20-year-old machines on board the ISS return data to Earth for processing but it can take 30 minutes for the data to travel each way. It is unlikely to be possible to send data back to Earth for processing from Mars, as the planet is millions of miles away. “Our servers cost thousands, rather than millions of dollars,” he added, speaking at the 2019 Mobile World Congress (MWC), in Barcelona , where HP is displaying a replica model of the ISS Destiny Module. The servers had needed some bespoke modification. Their air cooling system would not work in space. But the devices would need to be inspected back on Earth to find out what had gone wrong. ← What's missing from this bus?